London, England is turning into a hotspot of DIY SkiBike building, where SkiBiker SkiBike blog follower Carl is getting busy this week with his new diy project. 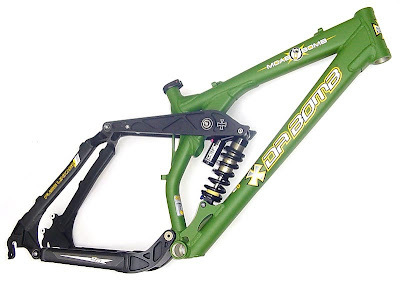 He has chosen to use a DaBomb Moab frame as the basis for his skibike. The Moab is a well respected item, ideally suited to riders who like big drops and fast downhill action. It receives great user reviews and some claim these frames will withstand a 20 foot drop. Hopefully any such drops will be planned and not unintentional.